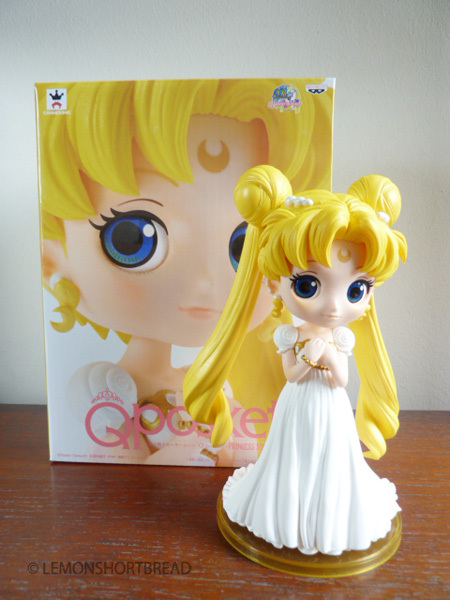 Got the matching Princess Serenity to the Q Posket Sailor Moon (read about it here)! Very pretty, something about the proportions that are quite appealing to me! 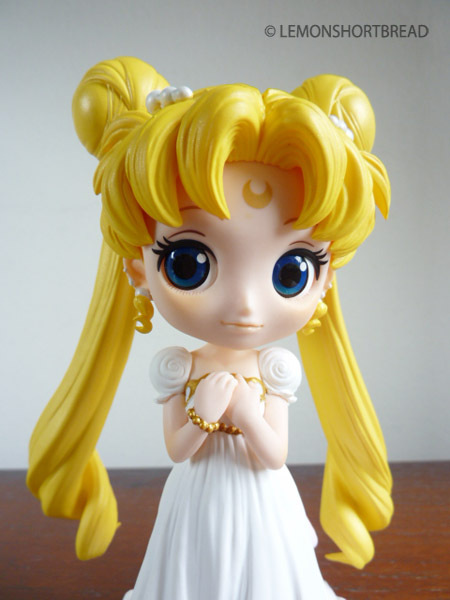 Some people might be uncomfortable at her alien eyes but I dig this chibi style. She was released in Oct 2015. 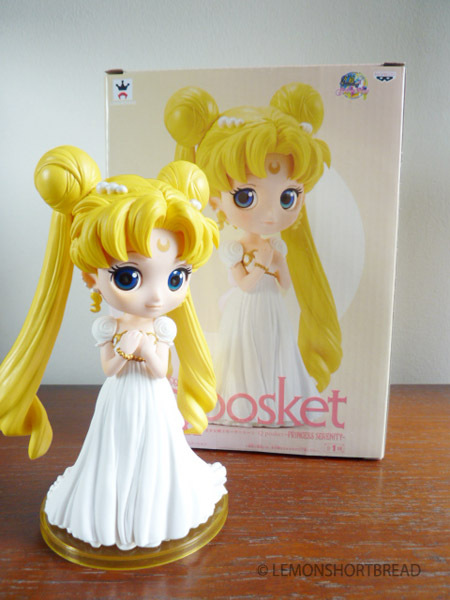 There are bootlegs around but this is the original one, I got her from La Tendo for S$26. Why would anyone get the inferior bootleg that costs around the same price anyhow? To identify the bootleg, just look at the box. The original does not have a window so you can't see what's in it, and it comes with the bandai holographic sticker (in my country at least). 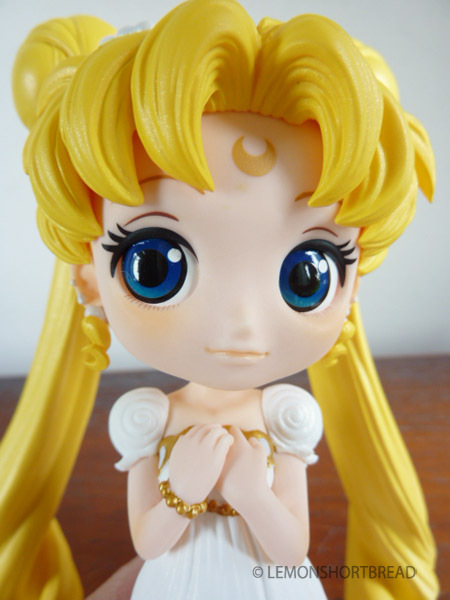 I recall the bootleg has matte, not so smooth irises on her eyeballs whereas the original has smooth, glossy irises. I took a quick glance at one of the local shops selling the bootleg and almost got fooled. She comes in three pieces. This time there is no prop stand for her head. The amazing thing is she has feet! I mean they could have just have a flat bottom. Love the details that goes into this. 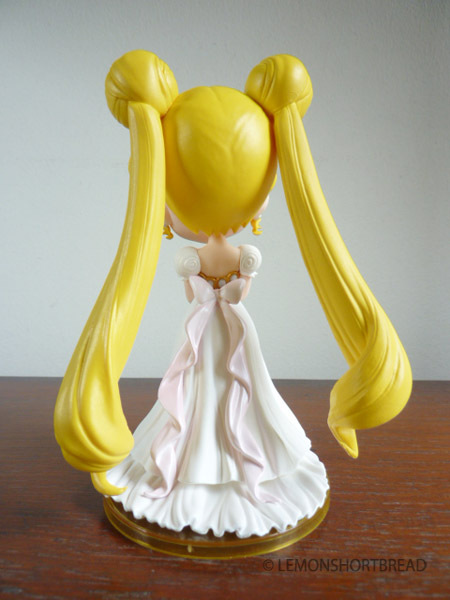 Her head screws on tighter than the Sailor Moon one which is better. She is also easier to fit into the stand. The drapes in her dress are very nice. 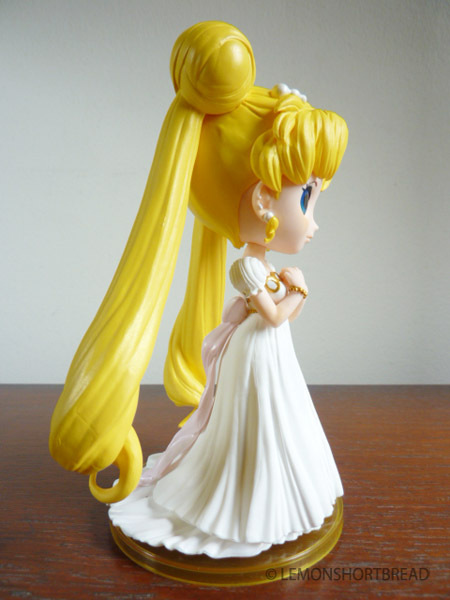 The white pearlscent paintwork has a golden shimmer against the light. 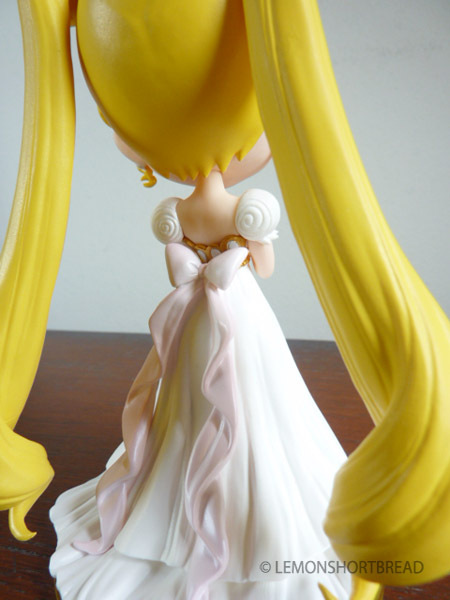 Her hair also has a pearlscent yellow effect. 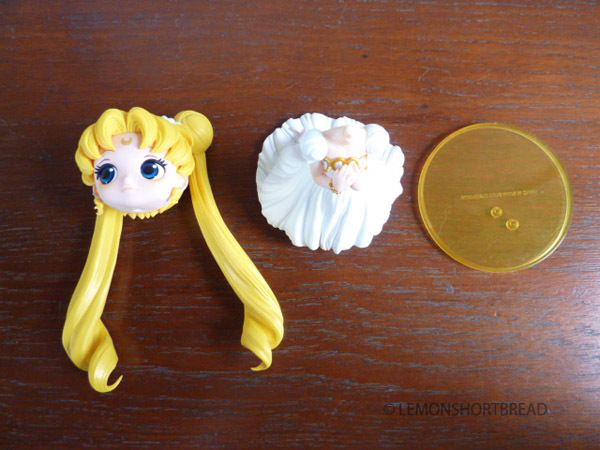 There is a mold line on top right of her head, facing front. She weighs heavier than she looks. Her skintone is actually a bit pinker and intense in person. Her makeup is an orange tint. Her moon crescent on her forehead is golden. 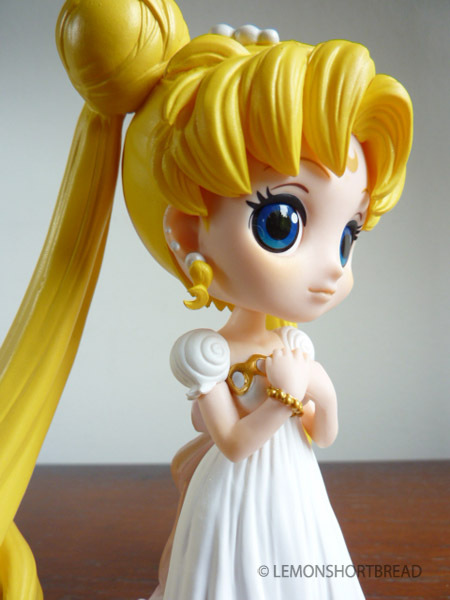 I absolutely love her, usually I skip Usagi as Princess Serenity but this one is too cute to resist! 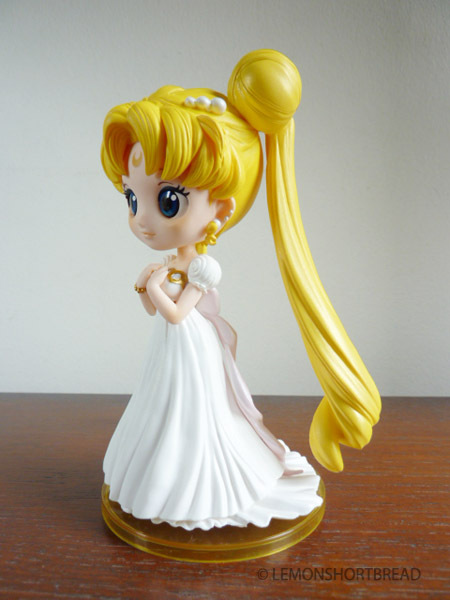 I am eyeing the petit version 1 and 2 that comes with the inner Sailor Scouts + 2 versions of Sailor Moon, but all the stores package them in sets of three, and I don't really need another version of Sailor Moon in the same pose. They are also too small to oogle at lol. We shall see!